The High School Student (with No Work Experience) Job Resume Template is a beginners tool which can greatly increase the chances of attaining an interview. The goal of any resume is to get a face-to-face interview. This document acts as a paper introduction to the candidate and his or her skills. Thus, one must make sure to have a good one because this will be an integral part of the decision making process a recruiter goes through when deciding the interviews that will result in a positive hire. A template is a document with predetermined sections that will require a user to input information to. This information may be revised for a variety of reasons (not the least of which to cater to a potential employers preferences) and the High School Student (with no work experience) Job Resume will also accept additions to various sections as a job seeker’s experience grows. When filling out this resume, remember this is how the potential employer will view you. Make sure the language used is polished by not using the same adverbs or adjectives twice. It is also a very good idea to set aside an ample amount of time so you may concentrate and devote your full attention to the task. If this template is filled out correctly and you have represented yourself in a professional manner in both the High School Student (with no work experience) Job Resume and your cover letter, the chances of gaining an interview will increase dramatically. Step 1. The first step will be to enter your name and contact information at the top of the page. There are certain liberties one can take to make it eye catching. For example you can enlarge the font for your name. It is customary to center this information and if you do, it may be a good idea to center the headings of each section (avoid centering the content under the heading). Step 2. The next section, “Objective” is where you will have an opportunity to display your communication skills. Write two to three sentences describing yourself from a professional point of view as well as how you would function in this position. Hint: Reread the job listing you are answering and attempt to directly relate to one or two things. Step 3. 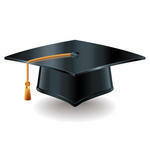 The “Academic Qualifications” section is where you can list any relevant course work you have taken and your academic standing. Step 4. The next section should be named according to the position you are applying to. 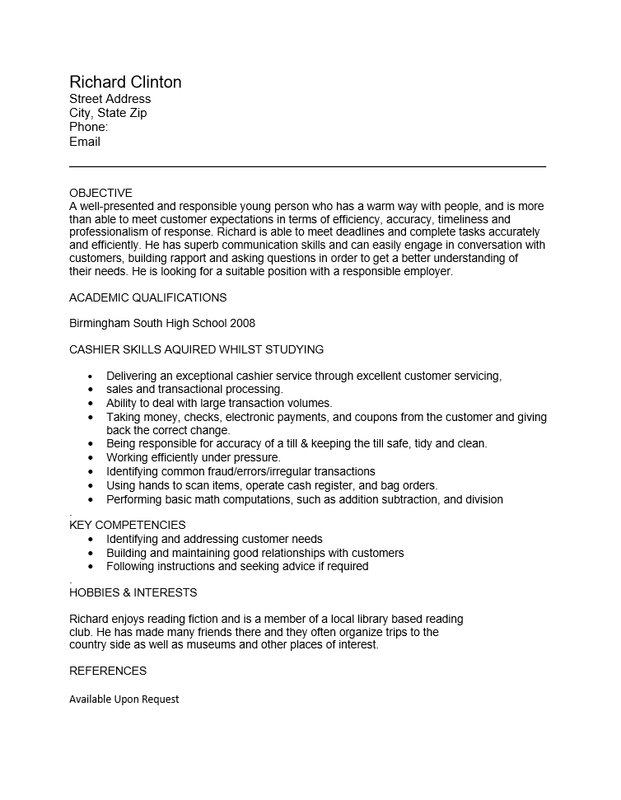 The sample below is a resume geared toward a cashier position therefore the name of this section is “Cashier Skills Gained Whist Studying.” This section will require some creativity on your part as you will need to relate your academic experience to the job position. Each skill should be a short statement and placed in a bullet list under the heading. Step 5. The “Key Competencies” section is a standard section for many resumes. This will be a list addressing skills you possess that directly relate to fulfilling general and specific duties one will have to perform regularly in the position you seek. Think of this section as an outline of showing why you think you would be good at the job. Step 6. The “Hobbies and Interests” section is where you can display your individuality. List activities that occupy your spare time or hold your attention. This may be in whatever format you prefer (i.e. bullet list, paragraph with each interest separated by a comma. Keep in mind this will be read by a potential employer. Step 7. The final section of many resumes is the “Reference” section. Most employers will wish to speak to an individual, (preferably a non-family member) who will vouch for you. You may either confirm that you have them with a statement like “references available upon request” or you may list their contact information. Note: Before listing anyone’s contact information or using anyone as a reference confirm with that individual that it is alright to do so.